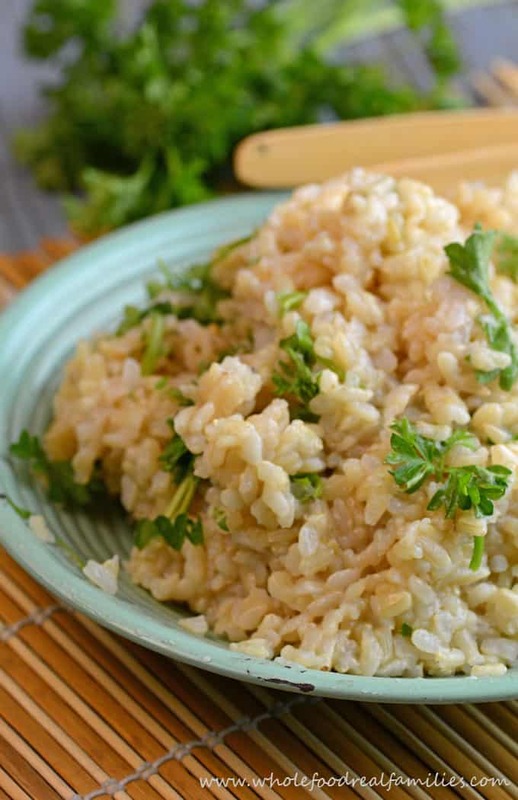 Herbed Brown Rice is going to take the place of your plain white and plain brown rice. A few tweaks and simple rice turns into a rich, flavorful side dish. Brown rice is a great whole food choice when getting rid of white, more refined side dishes. But at our house, plain brown rice is rarely received with excitement and we don’t even keep white rice in the house. It is just something we pour stuff over or use to stretch meals. In an effort to make brown rice stand alone in a food blogger’s kitchen, I had to liven it up a bit. Cooking the rice in stock, seasoning it well, and tossing it with fresh herbs changes everything about simple brown rice. 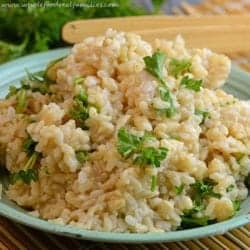 Cooked well, this Herbed Brown Rice become a flavorful side dish that makes the adults and the kids happy. This version is our go-to but we often jazz it up with a variety of different herbs – generally the herbs I use in the main dish get tossed in the rice too. Herbed Brown Rice goes great with Creole Style Gumbo, Beef and Mushroom Saute, as an alternate stuffing in Stuffed Red Peppers – or toss it with cilantro with a squeeze of lime juice for a fast side to any Mexican inspired meal. By the way, I love doubling this recipe and using later in the week for this Healthy Vegetable Fried Rice recipe! It all goes on the table in about 10 minutes if the rice is already done! Put rice and water and salt into a medium sized pot and bring to a boil over medium heat. Reduce heat to medium-low, cover pot and simmer until liquid is absorbed and rice is tender, about 40 minutes. Remove pot from heat and let rest for 10 minutes. Uncover, stir in chopped parsley and serve. So, not so much Herby rice, rather rice cooked in stock to give it flavour with a pinch of herb on top. Not surprising it goes down well though, anything cooked in salty meat stock is flavoursome. I served this rice with steak tips and scallops…it was excellent. I did however add some fresh grated parmesan cheese. I’m guessing you mean chicken stock but not water? You replace the water with chicken stock right? You don’t use both? Exactly. I use broth instead of water! When do you add the chicken stock? I put it all in at the same time.